Aid Begins To Reach Besieged Syrian Region, As Civilian Deaths Continue : The Two-Way Trucks loaded with food people have entered Eastern Ghouta, but many medical supplies were blocked. Despite an ostensible "humanitarian corridor," shelling continued as the aid was being delivered. 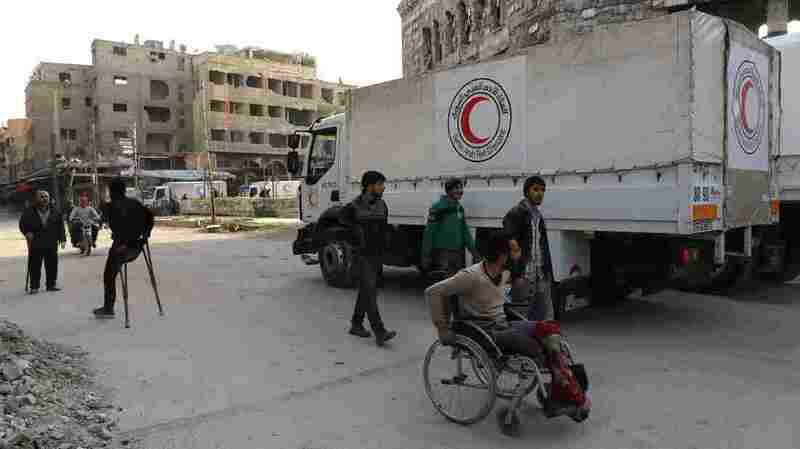 A convoy of Syrian Red Crescent trucks arrives in Douma, in the Syrian rebel-held enclave of Eastern Ghouta, on Monday. This aid convoy is the first to reach the besieged area in weeks. Aid supplies are beginning to reach the besieged community of Eastern Ghouta for the first time in weeks. 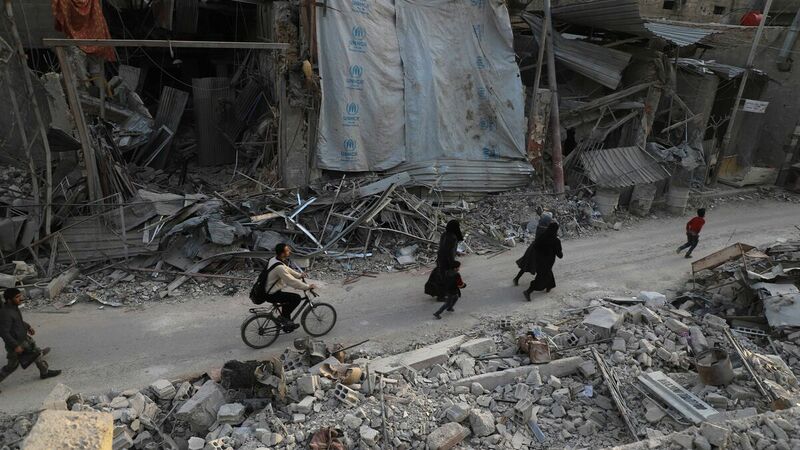 But air strikes continued even during the aid delivery, despite the ostensible "humanitarian corridor" put in place by the Russian government, and dozens of civilians were killed in the Damascus suburb on Monday. The Syrian regime also refused to allow many medical supplies to enter the region, stripping them out of the aid convoy. The blocked supplies are "desperately needed to save lives and reduce suffering," the World Health Organization told NPR via email. Eastern Ghouta, a rebel-held suburb of Damascus, has been bombarded for months, with airstrikes by the Syrian government and Russia accelerating sharply February. Some 600 civilians are estimated to have died in in the past few weeks. The U.N. Security Council demanded a cease-fire across Syria more than a week ago, but the bloodshed in eastern Ghouta continued. Then Russia called for a "humanitarian corridor" to be established, to allow civilians to leave and aid to enter. But convoys still weren't able to make it through — U.N. officials "said that lack of approvals and consensus among the warring parties, as well as the limited duration of the daily, five-hour pause, had made aid delivery impossible," the Associated Press reports. An estimated 400,000 people remained trapped in a dire situation, without food or medical supplies, amid ongoing airstrikes, ground attacks and alleged chemical weapon attacks. 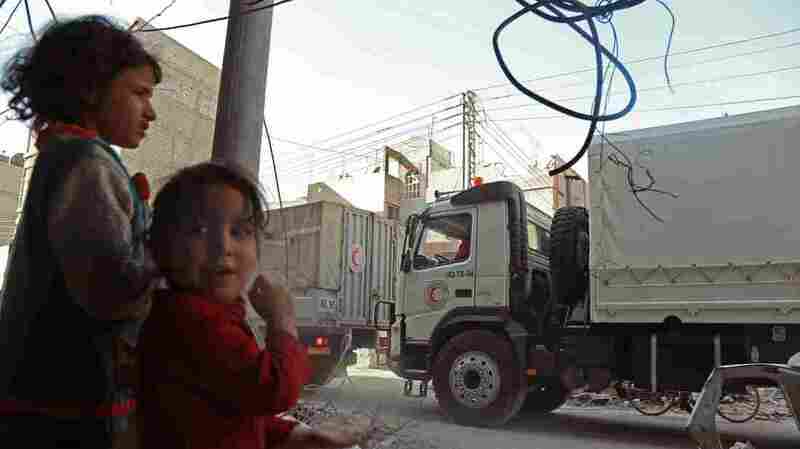 A convoy of Syrian Red Crescent trucks arrives in Douma, in Eastern Ghouta, on Monday. The convoy contained food aid for tens of thousands of people, but many medical supplies were blocked by the Syrian regime. Now, 46 trucks of supplies have reached Eastern Ghouta, as part of an inter-agency convoy arranged by aid groups and the United Nations. Monday's shipment includes enough food for more than 27,000 people, according to the U.N. and the Red Cross/Red Crescent, with more deliveries planned for later this week. The U.N.'s last aid delivery to the region was weeks ago, and the Red Cross last reached the area in November. But not all the supplies in Monday's convoy made it through: Seventy percent of the medical supplies were blocked by the Syrian government, a U.N. representative told The Associated Press. "Three of the 46 trucks being sent to Duma today are close to empty," Marwa Awad, a spokeswoman for the U.N.'s World Food Program in Damascus, told The Associated Press. An official with the World Health Organization told NPR via email that the supplies were removed by government officials during an "obligatory routine inspection" of the convoy. "All trauma [kits], surgical, dialysis sessions and insulin" were rejected by Syrian national authorities, spokesman Tarik Jasarevic said. The supplies remain with the WHO, which will attempt to send them again in a future convoy. "Virtually no medical care available"
Eastern Ghouta has been suffering from a critical shortage of medical supplies even as casualties from air strikes are mounting. Two weeks ago, Zedoun Al Zoebi, the CEO of the Union of Medical Care and Relief Organizations, said in a statement that "medicine and medical supplies have not been allowed into the city for months now, and there is virtually no medical care available for these people as they suffer severe trauma wounds." Deadly attacks continued even on Monday — including during the time designated by Russian and Syrian authorities for safe passage, according to reports from the ground. Lobna Hosairi, media communications manager at the Syrian American Medical Society Foundation, tells NPR's Linah Mohammad that dozens of deaths were reported by SAMS staff on the ground on Monday. The Associated Press reports that the Syrian Observatory for Human Rights, which is based in London, estimates at least 50 deaths. Hamza Hasan, a doctor with SAMS in eastern Ghouta, told Linah that at least 89 people were confirmed to be killed on Monday, including a SAMS doctor. The death toll is expected to rise, he said, as more bodies remain under the rubble and have not been counted. Despite the claimed "humanitarian corridor" for the convoy, the deadly shelling continued even as the convoy was delivering aid, he says. "A senior U.N. official accompanying the convoy said he was "not happy" to hear loud shelling near the crossing point into eastern Ghouta despite an agreement that the aid would be delivered in safety.
" 'We need to be assured that we will be able to deliver the humanitarian assistance under good conditions,' Ali al-Za'tari told Reuters at the crossing point." SAMS staff and civil volunteers also tell NPR that after the convoy arrived in Douma, nine vehicles were not unloaded, and sent back with their cargo still on board. Siraj Mahmoud, the spokesman for the Syria Civil Defense, better known as The White Helmets, tells Linah the shelling was "very severe" in the presence of the convoys, and targeted residential neighborhoods. The nine trucks remained unloaded because the convoy was ordered to leave Ghouta immediately before the aid delivery was complete. The deadly conflict in eastern Ghouta has been compared to the bloody fight for Aleppo in 2016, which also left hundreds of thousands of people trapped by bombardments, without access to food, fuel or medical supplies. That battle killed thousands of civilians, according to the White House. "We call it literally in Syria, heaven on Earth. Beautiful olive trees — some of the olive trees there actually are 500 years old. People there are simple and kind, very moderate. But they are very secular. You can see Christians and Muslims living there together in harmony for hundreds of years. How can I say? It's a spot that was reserved from time." Now, he says, "the situation in Eastern Ghouta is simply horrible. It's beyond description." Syrian civilians run after an aid covoy, not pictured as it entered the rebel enclave of Eastern Ghouta on Monday. The same day the Syrian regime pounded the region with fresh bombardment, killing dozens as it seized more ground. On Sunday, the White House issued a statement condemning the ongoing offensive against Eastern Ghouta, denouncing the "combination of lies and indiscriminate force" by Russia and the Syrian regime. "Between February 24 and 28, Russian military aircraft conducted at least 20 daily bombing missions in Damascus and Eastern Ghouta from Humaymim Airfield in northwest Syria," the White House wrote. "Pro-regime forces must immediately cease targeting medical infrastructure and civilians as part of the brutal campaign in Eastern Ghouta. The civilized world must not tolerate the Assad regime's continued use of chemical weapons." The arrival of aid in the region has been welcomed by aid groups, but they emphasize it is insufficient to meet the need of desperate residents. "This is the first slight easing of the siege," the BBC's Jeremy Bowen reports from outside Ghouta. "It's only temporary, though; the wider issue here is that the Syrians with their Russian allies are pressing very hard onto eastern Ghouta and if they win here, and the indications so far are that they will, it will be a major victory for President [Bashar] Assad and his regime." "The Syrian army and allied militias are making gains on territory they have laid siege to for more than four years. The government-controlled Central Military Media says troops have captured at least six villages and towns on the fringes of the sprawling besieged suburb. "A member of an anti-regime militia in the area confirmed the offensive to NPR. He said the pro-government troops are advancing across the more rural — and less heavily populated — territory." "Assad and Russia have both repeatedly accused the rebels of stopping civilians fleeing eastern Ghouta to use them as human shields. The insurgents deny this and say people there fear arrest, torture or forcible conscription by the government if they leave."